Island display wine rack rolling casters for under racking kit. 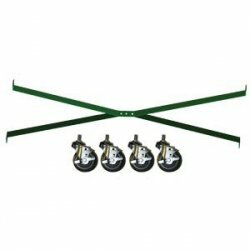 Kit includes four - 4" casters, brace and mounting hardware. Note: FREE SHIPPING ON THE ACCESSORIES WHEN ORDERED WITH OTHER RETAIL RACKS. Shipping charges will apply if ordered separately; you will be notified of cost.